The prime purpose of Yamba Surf Life Saving Club is to patrol Main Beach, keeping it safe for the beach-going public. The club has approximately 10 patrol groups who are rostered for duty on week-ends and public holidays throughout the summer season. The patrol season commences at the start of the September school holidays and finishes on the last weekend in April. Patrol members must hold certain SLSA lifesaving awards and must requalify at the start of each season by doing their Proficiency test. Each patrol contains a minimum of 4 Bronze medallion holders, an IRB driver and an Advanced Resuscitation Certificate holder. The commitment to patrol duty is to be undertaken seriously by those who are rostered for duty. Throughout the season Yamba Surf Club conducts various training courses for a number of surf life saving awards. Courses are listed on the calendar. 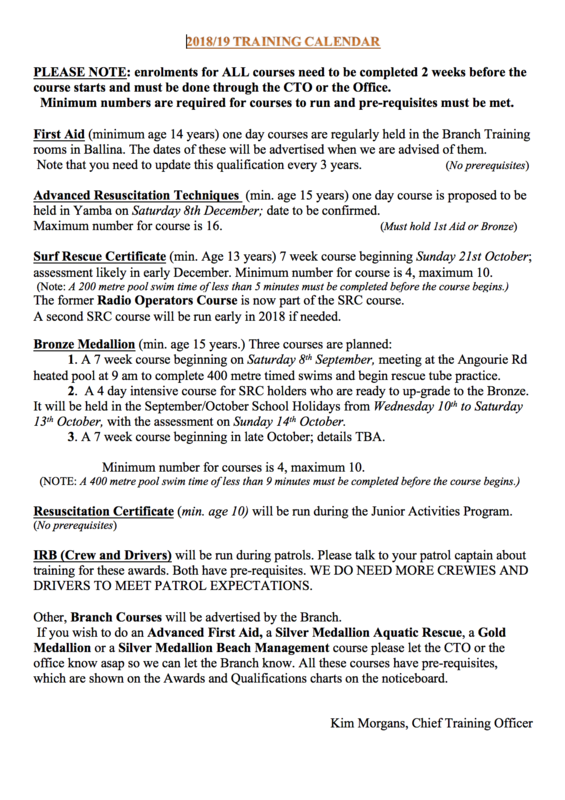 Courses are also advertised in the monthly club newsletters available on this website, and in the ‘Weekly News Bulletin’ on this site during the patrol season. All members are encouraged to continue to update their skills by undertaking some of the courses on offer throughout the season in order for Yamba Surf Club to continue its prime purpose of patrolling our beach. If you have any enquiries regarding training for awards, please contact the Club’s Chief Training Officer – Kim Morgans on 6646 2823 or contact the Club Office on 6646 2463 during office hours for further information. Contact our Youth Development Officer via secretary@yambaslsc.com.au. Second proficiency date to be set. A copy of the 2018/19 Training Calendar is attached - it may change.